Nope, not Ravelry. Still waiting. I drafted this pattern (my first ever!) 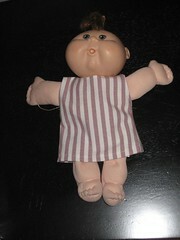 based on the actual measurements of Becky’s baby doll, Elizabeth. Children’s scissors included for scale. I am not yet cool enough to make sleeves. 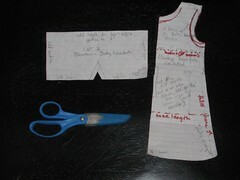 After I sewed this practice piece, I made some adjustments to the original pattern (the red lines in the previous picture) and made a bunch of notes on the pattern for the bloomers. Becky doesn’t care at all that this is ill-fitting, or that one of the back pieces has the facings stitched inside-out (which is just what I get for using material with no wrong side). I had no idea that this kind of thing would be so much fun. Miniature quilts have never been my thing (too fiddly), and I don’t even really care for paper-piecing all that much — though it does have a place and it’s functional in the appropriate use. But I am downright giddy about this little dress. Becky will be delighted — and then, if yesterday is any indicator, she will harass me continually until the matching bloomers are done. I have two more of these in the works, with the same style (though I may be ready for a sleeve by the time I get to the third one), and I’m finding that I’m more inclined toward embellishment as I do each one. This is really cool! I can completely see how Becky will be perfectly delighted! 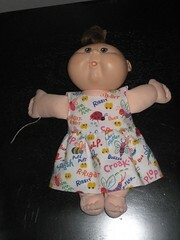 I have a dress that I made by hand with terribly crooked stitches when I was somewhere older than 7 and younger than 12. I can see how poor it is now, but then I just was really proud of myself and loved it. Also, we loved it when Mom made Barbie dresses for ours. Good job on your creativity and delighting your daughter!